I have to vent here. I am dying to get back into PSO. It has taken so long setting all of this stuff up. I am really anxious to start actually playing Phantasy Star Online again. It wasn't just the the time period after the servers went down, but before as well. I was very unmotivated to play PSO knowing that the servers were to be terminated. It was depressing really. Now that we have a perminant solution for PSO I can relax and put my mind at ease. I am trying to figure out what new character I am going to create, and which memory card I am going to use for this new character. I have been using a third party nYko 8MB memory card so sometime now. I have a certain supersition about these cards. They have never corrupted on me ever. I fear starting a character on a Nintendo brand card might jinx me. In any event, if you guys are dying to get back into PSO as well, what type of characters are you thinking of starting? I might create the HUcaseal I made from PSO Episode III and use her in Episode 1&2. Good to see you starting playing some games with the OC community again in the 3 different formats . Also thank you for making this servers . It seems very easy to connect, which is nice. 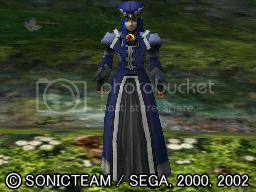 Some 3rd party MC may be good, though I always try to use official memory cards for important saves like PSO. I have some 3rd party MCs and they always worked ok, though one time when I made a 2nd Animal Crossing town after a few months the town got corrupted. During those months sometimes it said it couldn�t read town, etc�In that MC was the only game I had problems. AC is a bit sensitive, but maybe games that save a lot is better use a official MC just in case. This is one of those games where losing a save, can be a big disappointment. But if you ever used the Nyko MC and never had problems with PSO and any other game, might be a possibility, it�s your choice. Official cards never failed on me, and probably only happen if is defective. It might last longer too. Dreamcast official MC never gave me problems too, just for another example, can�t say the same for some 3rd party (especially if they have higher capacity). It�s good if we can have different classes from people that play. Imagine 4 FOs or Casts, I don�t think it would be fun. I was a bit undecided about which character to play. I have more than 1300 hours of experience playing support FO in all versions (using FOnewearl), it�s not easy and not many people use to do it well, but I always enjoyed it much and my 1st ever character in PSO was a FOnewearl actually (My Dreamcast Shinma character). So at start I wasn�t inclined to play FO again. I also play Dreamcast version so didn�t want to play same characters I have there (HUmar � FOnewearl). Because of that decided to play with one of the new classes the Ep. I & II offers. My main character some years ago in GC was a RAmarl (then lost it by corruption: Lobby freezing spam), so only HUcaseal and FOmar left. I decided to play with FOmar because my new OC character I made for the Dreamcast version is a Cast (RAcast) so didn�t want to play with Casts in both versions. For some reason I think it was the right choice for me . All characters in Ep I & II are now very balanced, so it�s interesting if people can play with different characters. It would be also very good for trades, etc. Well, seeing as how my buddy completely cleared my 251 out (including my Lv. 73 HUcast) awhile ago, I really had no choice but to begin on a clean slate. Started playing as a HUmar, but it so far hasn't really done much for me. The gameplay style is too similar to the HUcast, which I have burnt myself out on after having played nearly 400hrs on the DC and 80 on the GC as one. I then created a FOmar, just to see what the differences were. I found myself with a rejuvenated interest in the game, as I have dabbled in playing as a Force before, but have not really invested serious time into doing so. BTW, when I first began playing PSO, I was using a nYko 8MB memory card. My PSO data was completely destroyed the first time I played online. I then put my foot down and refused to play again until I was able to purchase a Nintendo memory card. It was the most bizarre coincidence ever because it nearing 8PM on a school night when this incident happened. My parents had just asked if I wanted to go shop at Wal-Mart with them minutes before I connected. Usually, I would of given a look of sheer pain and loathing towards going to Wally World, but I figured, what the hey, might be the only chance I get to buy a memory card in awhile. What also struck me as absolutely bonkers is that I had just enough cash on me to buy a 251. Making a RAcast this go around for play online. I'm going to heed your advice Nikon, and not use my offline character Metro Cowboy. My main deal is this: So there's not too many of us, right? 2 words for you: challenge mode. Starwalker and I are both a bit experienced at C (him more than me though, I'm only a Bu-EI 2 times now) But I think we've got some good players, and let's get some s-rank weapons! Good to see you joining too U-235 . Also good choise of character because we don't have any Ranger yet, and its nice to see some robots. I'd love to play Challenge more again, though I think we need to play more together the normal game before starting Challenge. Challenge can be very hard and can get a bit frustration for some people. Maybe later we can have a mix of normal game and challenge. It's good to have another person that already have experience in Challenge, because when its only me and other people, it's hard to do the runs and explain things, etc. We need to start in Ep1 and then only after start Ep 2, because Ep 2 stages are very big and hard usually and can get very frustating if people don't have some challenge skills already. But people need to play more regulary for challenge to work. But with 2 people with experience, Ep 1 will be a lot easier. I just need to relax and leave the TA spirit i gain for playing it much. What I love about challenge is that we are always learning with every run and it's good to see the group getting more cohesion as we play. Yes, once everyone knows the areas it is very fun. Perhaps I will be making 2 RAcast's then, one for C and one for Regular play. I plan on passing s-ranks off to my main character offline. I think for ep1 C all I need is 7, 8, and 9. I played a little bit of C with JP on the official GC servers, when they were up. It was easier to get cmode games going on the DC though, because the JP players there knew me. On the GC version I was just another distrusted American.